Today is Fathers’ day on the secular calendar, so congratulations to those of you who are fathers! And I would remind all of you to visit or call your own fathers if they are still with us—and to offer a prayer for them whether they are or not. The second collects of this Mass are for all the deceased fathers and mothers of this parish, and of our friends and benefactors. I can think of no more appropriate words than those I just read from Saint Paul’s letter to the Ephesians. to introduce this sermon—those of you who attend Mass on First Fridays probably recognize them from the Mass of the Sacred Heart of Jesus. Fatherhood on earth is something patterned on the Fatherhood of God in Heaven. You may recall that back on Pentecost Sunday, which was Mothers’ day this year, I mentioned to you that all human activity is patterned on the image of God as we understand it in the Holy Trinity. Human beings and angels have intellect and will, which is to say that we are capable of both knowing and loving. We have these faculties because God made us in His image and likeness. Those of us here, who are fifty or sixty years old or more, lived through the turbulent years of the 1960s and 70s, when it seemed that all of the values of Western Civilization were being repudiated. Time honored ideals seemed to be discarded with each passing day—often by those whom we viewed as the appointed guardians our society. In the United States the population was divided by a war that was ten or twelve times as bloody as our war against Iraq and Afghanistan has been so far, at least as far as American military casualties. We had the Professor of Psychology at Harvard University telling us that should use mind‑bending drugs to escape from society: “Turn on, tune in, and drop out.” Our Supreme Court arrogated a power belonging to God alone, denying the right of life to those hitherto protected by law in each of the fifty sovereign States, protected by our federal Constitution, and proclaimed in our Declaration of Independence. We Catholics experienced the unmitigated disaster of the Vatican II era, with its inversion of Catholic morals, subversion of Catholic doctrine, and perversion of Catholic worship. Those of you who are younger may not remember the 60s and 70s, but you can still see the long term damage that done to civilization during that period. Perhaps the greatest victim of this revolution (and revolution it was) was the institution of the family, and the role of fatherhood. The damage to these may well be the greatest challenge to Western Civilization and to the Catholic Faith today. When I was a boy, we would watch a TV show called “Father Knows Best.” The father was always portrayed as a wise man, and also as a compassionate men—together with his wife, he guided their teen aged son and daughter through that difficult time of adolescence. Today you turn on the TV, and if the family has a father at all, he is either an idiot, or a violent abuser of wife and children. Men in general are perceived as having no morals whatsoever. The damage of the sixties will not be undone in our lifetimes—one cannot put the Genie back in the bottle once it has been released. But, certainly, we who are fathers ought regularly to call to mind the proper role given to us by God. One cannot speak of a man as husband or father except in relation to his wife. Our Lord tells us that from the very beginning the design of God was to unite one woman and one man in a union that would be permanent for their joint life time: “for this cause a man shall leave his father and mother and cleave to his wife and the two shall become as one flesh.” This stability in marriage is essential to marriage’s primary end (or purpose) of bringing children into the world and educating them to please God—“procreation and education,” we often say. Yes, single parents can raise children, sometimes they do a good job of it. But it is certainly more difficult to do so than it is for a husband and wife in a loving relationship. We men, and boys who will soon be men, ought to reflect on the fact that God has made us generally stronger and more aggressive than the women and girls we know. Those traits must always be directed toward fulfilling God’s plan. We must always think of that strength as given us to be protectors, not just of the wife that we may some day have, but of all women—what an outrage against divine providence for a man to use that strength to harm or take advantage of any woman, or of her children. That strength is also given us in order that we may be providers for our wife and children. A husband and wife enter into a covenant of equality, but some responsibilities weigh heavier on one, and some on the other. Sometimes illness (or, God forbid, death) shifts the burden to one or the other, and we must be prepared to face that possibility, but is certainly not the norm. No man (or woman) should take the pleasures of marriage on himself for selfish gratification—not outside of marriage, but not within it either. Marriage must always be open to children, and must never be tampered with by artificial means. Only with the most serious of reasons should a couple refrain from having children through natural means—the Modernist notion that children ought to be prevented through natural planning, has already resulted in demographic disaster, with the peoples of Christendom no longer having enough children even to replace themselves on the earth. W must choose life and choose to live in the “image and likeness” of God. And, let me close by reminding you that the “image and likeness” of God is seen in our ability to know and to love. And that may very well be the hallmark of a good father—that he takes the time to be with his wife and family. He may have to give up some of the time that he is accustomed to spending with his friends, but he spends the time it takes to know and love his wife and children. He must eat with them, and pray with them, and talk with them, and take his recreation with them, do whatever is possible to do with them. If we are to rebuild Christian fatherhood, we must rediscover the treasures we have in a wife and children. 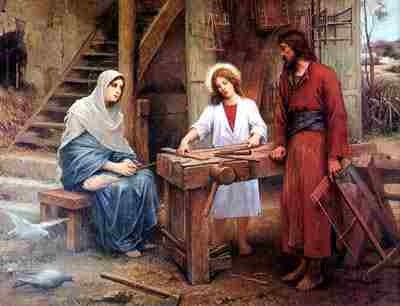 We must call upon Saint Joseph, the foster father of our Lord. We must rebuild Christian fatherhood along the lines of Holy Family, and with prayers for their intercession. And rebuild it we must—Christian fatherhood—for all fatherhood, in heaven and on earth, receives its name from the Father of our Lord Jesus Christ.